Travel Notes: Antelope Canyon (a.k.a. 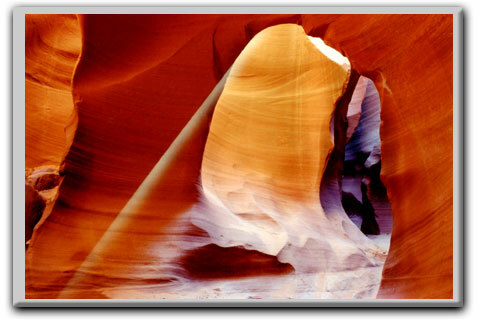 Slot Canyon) has lured many by its sheer mystic and wonder. Formed by years of torrential force, this deep, narrow scar has towering walls of winding marble orange. At midday the sun shoots down panning spotlights from the threadlike rim above. It is at this time that photographers attempt to capture the lightshow. I was at first leery of ever exploring this place. In 1998, I rode for the first time past the mouth of the canyon. My tour guide began to tell our group a horrific story. Months ago, a flashflood had taken the lives of 12 tourists. He felt unrelentingly guilty because it was he who had discovered this canyon for his company three weeks prior to the catastrophic event. Captured by its awe, he highly recommended this unique destination to his cohorts. Of the 13 to have explored the canyon that day, only the friend of my tour guide miraculously survived. Frequently, beautiful media images of the canyon would appear and subconsciously encourage me to come and explore. Then the pivotal one appeared on television: Illuminated by a cascading spotlight flecked with earthen dust, Alanis Morissette sailed her voice within the canyon walls. This scene mesmerized me, and I therefore decided to bump up the date of this destination on my timeline. When standing here my thoughts race to those who had life, but then were suddenly washed away, flushed out, with no forewarning, to be nevermore. Life is so full of promise, and then a passing moment, and everything is gone. No journey is worth the price of a life.